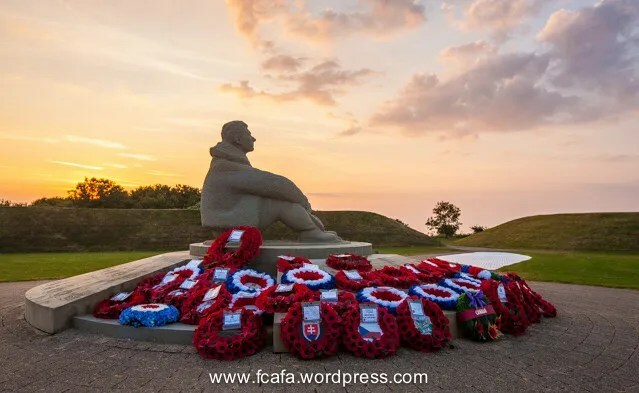 The Ceremony to commemorate the 73rd Anniversary of the Battle of Britain was held on 14 July 2013 at the National Battle of Britain Memorial, at Capel-le-Ferne, Kent. The Ceremony was honoured by the presence of His Royal Highness, Prince Michael of Kent GCVO, Patron of The Battle of Britain Memorial Trust. A total of 2,941 pilots flew in the RAF during this battle which lasted from 15 July to 30 October 1940.All these pilots are commemorated at this site, on the Christopher Foxley-Norris Memorial Wall, where their names are engraved. Eighty eight of those pilots were Czechoslovak, the second largest contingent of pilots from Nazi occupied countries in Europe. During this three month long campaign, nine of these Czechoslovak pilots were killed with others being wounded or badly burnt. One Czechoslovak pilot Sgt Josef František, serving with 303 Sqn, a Polish squadron, distinguished himself by shooting down 17 Luftwaffe aircraft during a 28 day period before his untimely death on 8th October 1940. This remarkable achievement earned him the position of being the most successful Allied pilot the battle. This year’s ceremony was the 20th anniversary of this annual event since this National Memorial was unveiled by the Queen Mother. With royality in attendance, flying from the flagpole was the Royal Standard, as well as the flags of the nations whose pilots had flown for the Allies during that three month battle and also the RAF flag. Eleven of ‘The Few’ attended the ceremony this year and, as usual, wearing a distinctive blue rose on their lapel. 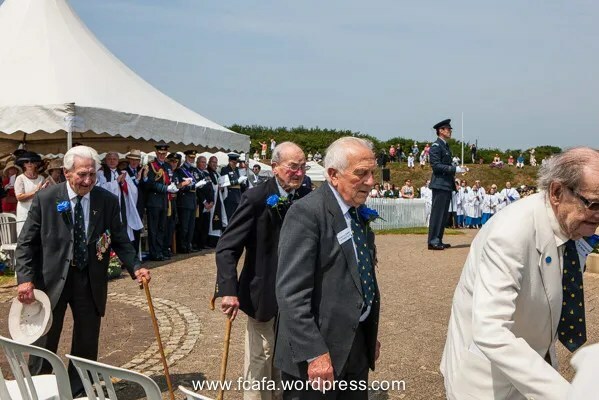 Attending the ceremony were also invited guests, relatives of some Battle of Britain pilots, local dignitaries, Air Training Corp squadrons from around Kent and South-East London, veteran servicemen and women and also several thousand spectators. The band of the 305 (Ashford) Squadron of the Air Training Corps played music prior to the ceremonies start. The Central Band of the RAF led the Standard bearers and Air Training Corp cadets onto the assembly area. The ceremony opened at 1:30 with a flypast of a Spitfire and Hurricane from the Battle of Britain Memorial Flight. 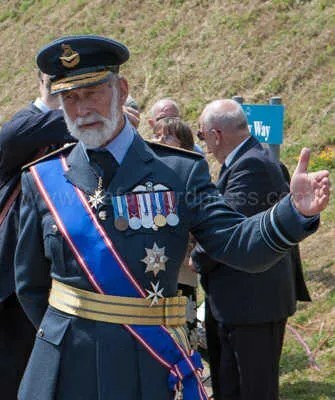 HRH Prince Michael of Kent, accompanied by Air Chief Marshal Sir Michael Graydon GCB, CBE, president of the Battle of Britain Memorial Trust, was introduced to the eleven veteran Battle of Britain pilots and then reviewed the 60 odd Standards paraded by ex-Service and Air Training Corp squadrons. Speeches then followed. During his speech Air Chief Marshal Sir Michael Graydon announced that enough funds had been raised for work on ‘The Wing’ exhibition centre, at the site, to commence. Work would start this August and would be completed by 2015 for the 75th anniversary of the Battle. 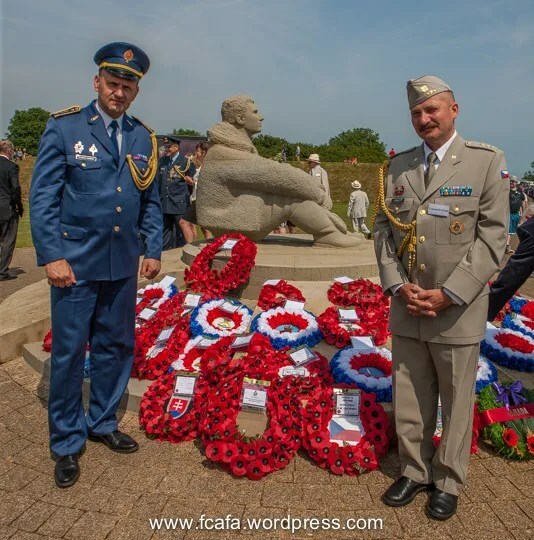 Wreaths were then layed at the Memorial by HRH Prince Michael of Kent, Air Chief Marshal Sir Michael Graydon, local dignitaries, representatives of various RAF Associations, local councils, Capel-le-Ferne primary school and Military Attache’s representing Australia, Canada, Czech Republic, New Zealand, Slovak Republic and the United States. His HRH Prince Michael of Kent then took the salute at the marchpast. Relatives of ‘The Few’ then went to the Christopher-Noxley Memorial Wall and laid flower bouquets. The Ceremony closed at 15:00 with the return of the Spitfire and Hurricane for a flying display. 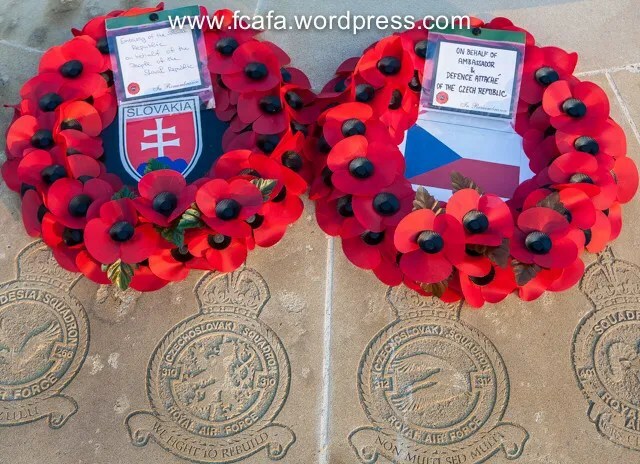 Representing and laying a wreath on behalf of the Czech Republic was Col. Roman Simek, Defence Attaché of the Czech Embassy, London. His Slovak counterpart Col. Vladimír Samek, Defence Attaché of the Slovak Embassy lay a wreath on behalf of his country. Displayed for the first time at this annual ceremony was the wartime Standard of the Polish Air Force. The original was the idea of Polish Air Force officers serving in France in late 1939, the design smuggled back to their occupied homeland and covertly made in the city of Wilno. 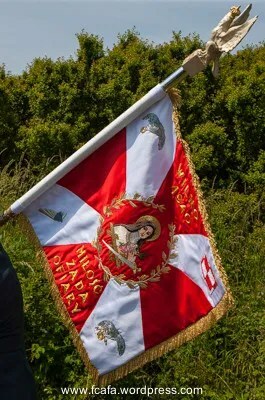 During the war the Standard was held in turn by each of the fourteen Polish squadrons. Like Czechoslovakia, post war Poland was also under the Communist regime and the Standard remained at RAF Northolt. In 1992, after the fall of Communism, it was returned to Poland and is now held at the Polish Air Force College at Dęblin. To commemorate the 20th anniversary of that event, an exact replica was commissioned by the Polish Air Force Memorial Committee in Britain. It was made in Poland and formally handed over in Warsaw in August 2012. When not used for ceremonial occasions it is kept as part of the Polish exhibition at RAF Northolt, the home of the Polish fighter Wings during the war. The design of the Standard is based on pre-war Polish military colours with broad red and white diagonal crosses. On one side it has at the centre an image of Our Lady of Ostrobrama from Wilno with the words ‘Bóg, Honor, Ojczyzna’ (‘God, Honour, Homeland’), and on the other an image of St Thérèse of Lisieux, ‘Wilno 1940’ and ‘Miłość Żąda Ofiary’ (‘Love Demands Sacrifices’). The eagle on top of the flagstaff was made by Spinks & Co. from silver and gold recovered from coins and rings given by Polish airmen in Britain. This entry was posted in 310 Sqd, 312 Sqd, Anniversary, Battle of Britain. Bookmark the permalink. I am named after Sir Christopher Foxley-Norris. My father severed as a Corporal in the RAF Police when Sir Christopher was in command of RAF Germany. From what I know, Sir Christopher can only be described as a gentleman. My only regret is that I never met him and Lady Foxley-Norris in person. Great stuff in this report!! Thank you – I must bully Chris to go one day, next year or for the 75th anniversary! Commemoration and remembrance of the few MUST never fade away as no less must not the revelations of the small occupied nations who played their RAF part to the full. Without their collective sacrifice I fear the war would have been lost at this point had we not won this important air battle and Czechoslovakia would have never gained it’s freedom from Nazi rule. Lest We Forget! Superb web site. Thank you.